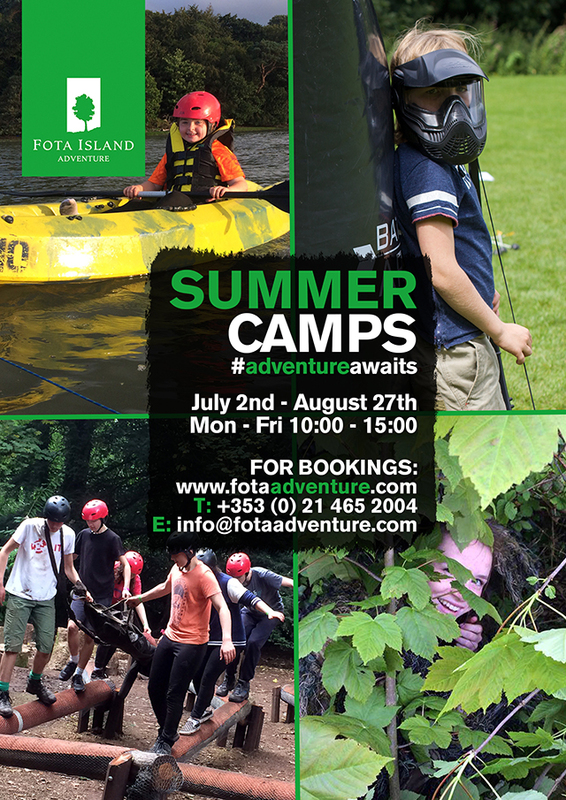 Fota Island Adventure has launched their 2018 Summer Schedule for both adults and children with their water sports and summer camps booking engine going live online. Hidden in the woods along the shoreline of Fota Island, part of the natural surroundings of the luxury Fota Island Resort, Fota Island Adventure is the perfect setting for a day packed full of excitement. The award-winning team at Fota Island Adventure have an extensive a skill set which has helped create this extraordinary summer camp. Last year the duo moved from from Spike Island to Fota Island to accommodate their ever expanding adventure centre and it has proved to be extremely successful which the centre recently winning the “Sports Business of the Year” at the annual Irish Sports Industry Awards. Their summer camps are entirely outdoors, with the woods in the five star resort providing shelter during the wetter days. The weeklong camp includes water sports (kayaking, canoeing and SUPing), bushcraft, survival skills, archery, Kombat archery, Battle Royale (“Fortnight” inspired woodland nerf game), world famous obstacle course, field games, orienteering, ECO trails and find the sniper (hide and seek military style). Cost: €130 per week or €50 for a day camp. Location: Fota Island Resort, Fota Island, Cork. Booking is available on fotaadventure.com or, alternatively, contact Fota Island Adventure for further information on +353 21 465 2004 or info@fotaadventure.com.